In honor of me turning 30, I’m making mix CDs of my favorite songs from each of my 30 favorite musical artists/groups. Read the introductory post for more background information on my 30 at 30 project. Reminder: there is no scientific rationale for this list. They’re simply my personal favorites. 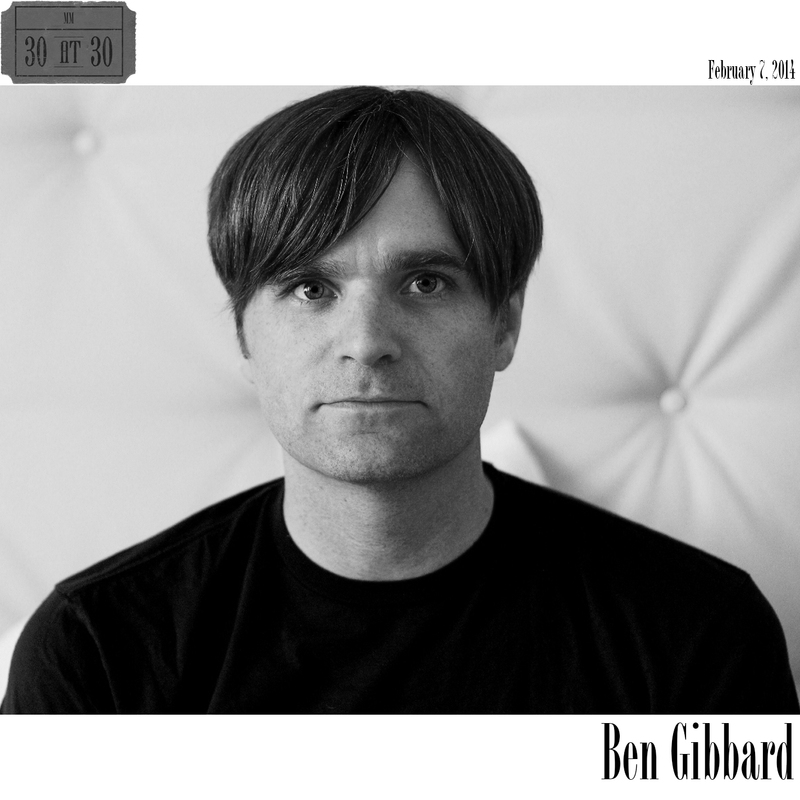 Coming in at number 24 is Ben Gibbard. If you only know Ben Gibbard as the ex-husband of Zooey Deschanel, you’re missing out. Musically, Gibbard is best known as the lead man of Death Cab For Cutie, although he has been associated with other groups including The Postal Service. I had to cheat the system a bit and combined Gibbard’s acts to compile the ultimate 30 at 30 compilation. Seventeen tracks come from Death Cab For Cute, three come from The Postal Service, and one comes from his 2012 Former Lives album simply released as Benjamin Gibbard. The tracks are all united by Gibbard’s unique voice. Although Death Cab For Cutie began in 1997, none of their early stuff caught my ear. I believe the first time I ever heard Gibbard’s voice was when Jessie played me some of The Postal Service’s stuff. The Postal Service’s Give Up was released in 2003, but it was probably sometime in late 2004 or early 2005 when I heard them. The electronic beats of producer Jimmy Tamborello sounded like something straight out of an 8-bit NES video game, and Gibbard’s vocals meshed perfectly. The songs were haracterized as “indietronic” and “electropop”—genres that are extremely limited in my personal eclectic collection. Nevertheless, “The District Sleeps Alone Tonight” and “Such Great Heights” were too good not to include in this ultimate Gibbard collection. It was a big year for Gibbard in 2003 as it also marked the release of Transatlanticism, the first Death Cab album I ever heard and one that landed six tracks on this compilation. When I think of Death Cab For Cutie, Transatlanticism is always the album that springs to mind. No matter how big we may build up milestone birthdays to be, the reality is that the start of the new year—in my case, turning 30—is not going to signal a dramatic change. Gibbard’s lyrics and vocals have a reflective, meditative effect on me. There is a distinct melancholy undercurrent that ripples through many of the tracks collected here. While I am fortunate enough to be in a loving marriage, the imagery in the songs he sings and the relationships he sings about are somehow cathartic, allowing me to exercise demons of relationships past—both real and imagined. 2005’s Plans landed five tracks on the compilation, including “Brothers on a Hotel Bed.” It is an incredibly sad song, but from a writing perspective, I love the image Gibbard uses of two lovers who have grown distant to the point that they feel like brothers in a hotel bed (keeping their distance from one another). It’s hard to believe that this song was written many years before his divorce from Deschanel as it would be a fitting soundtrack. Similarly, “The Ice Is Getting Thinner”, the only track to make the cut from 2008’s Narrow Stairs comes off as a somber warning of impending doom for a relationship. Gibbard followed up with The Open Door EP in 2009, consisting of tracks that didn’t make the cut for Narrow Stairs. In both “I Was Once a Loyal Lover” and “A Diamond and a Tether” he takes a look in the mirror and seems to place blame on himself for his relationship troubles, something I think any teen or twentysomething can relate to as they try to figure out that little thing called love and how it fits into their life’s plans. I close the compilation with the “Talking Bird” demo from The Open Door EP, a simple, sparse arrangement which I prefer to the full band version on Narrow Stairs. It’s another example of Gibbard’s writing prowess, using the metaphor of a bird—whose open cage door allows for the possibility of flying away—to comment on the tough decisions people face in relationships.